The incredible three days of 19 -21 August 1991 started with the early morning announcement that then Soviet leader Mikhail Gorbachev had been taken ill and a “State Committee on a State of Emergency” (GKChP) had taken over. 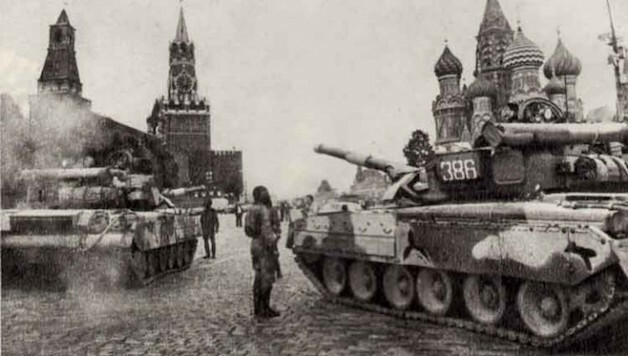 Tanks were quickly rumbling down Moscow’s main highways towards Red Square, provoking a mass uprising of the populations of Moscow, Leningrad, the Baltic States and elsewhere. Just three days later, the GKChP collapsed, Gorbachev returned to Moscow with dramatically reduced authority and Boris Yeltsin, the then leader of the Russian Federation, took over the reins of power. The road was opened to the collapse of the Soviet Union three months later and to the restoration of capitalism. Yet, according to this week’s Levada opinion poll, as if trying to wipe out a bad dream, 48% of the Russian population do not “remember anything particular” happening in 1991. At the time, however, the people living in the Soviet Union were desperate for change. The all-embracing post-Stalinist bureaucracy – through their corruption, mismanagement and contempt for working people – had driven the soviet planned economy into decline. Workers’ living standards were, at best, stagnant. Many workers, led by the million-strong miners, demanded radical reform of the system; initially they had no great desire to ditch the planned economy but wanted to dramatically reduce the power and wastage of the bureaucracy. Not so, however, the intellectuals, urban elite and significant sections of the ruling Communist Party, in particular the young “communists”. They were contemptuous of the working class and envious of the ‘freedoms’ that existed in the west that enabled a small elite to get rich. With no workers’ organisation arguing for the working class to take political power from the bureaucracy and establish a genuine socialist society based on workers’ democracy, workers lost hope that the soviet system could be restored and lent their support to that section of the bureaucracy that was in favour of market reforms and eventually the restoration of capitalism. Boris Yeltsin, who led resistance to the coup, was himself a leading “communist”. He promised the Russian people an end to corruption, privilege and the all-pervasive power of the party bureaucracy and sovereignty for the national minorities and republics. He also promised the establishment of a modern “market” economy allowing the country to integrate itself in the global “normal, civilised” liberal democracies of the world. Workers were promised better living standards and control over their own workplaces and industries. Incidentally, the aged bureaucrats who headed the coup attempt in the name of preserving the “Soviet Union“, were just as intent on ‘reforming’ the Soviet economy. The only difference being that they wanted to implement reforms in the way that the Chinese regime has tried to do, based on the restoration of capitalist relations under strong centralised state control. The plans and promises of the ruling elites were in stark contrast to the warning that was given at the time by supporters of the CWI in their paper ‘Workers Democracy’. We warned that the restoration of capitalism would not lead to more democracy, but instead to the Latin American-isation of society, with huge increases in poverty, unemployment and inequality. But even we underestimated the catastrophe that would follow on from the restoration of capitalism in the republics of the Soviet Union. According to the British medical journal, ‘The Lancet’, over a million men of working age in Russia died “due to the economic shock of mass privatisation and shock therapy” in the decade following the coup attempt. Life expectancy of a Russian male reached its highest level of 65 years, at the end of the Soviet Union, before collapsing to less than 60 for the decade and a half that followed the coup. Only recently has it crawled up again to 65. Democracy in the sense of genuine and relatively free multi-party elections, albeit without the participation of genuine workers’ parties, has established a certain foothold only in the Baltic states and to a degree in Moldova and Ukraine. According to the British newspaper, ‘The Guardian’, of the 120 national elections since 1991 held in the ex-Soviet republics, excluding the three Baltic States, only 22 have been free and fair. The situation is bad enough in countries such as Russia where an authoritarian regime uses a parliament (State Duma) as a democratic fig-leaf while making it practically impossible for any genuine opposition party (even pro-bourgeois parties) to participate in elections. In Kazakhstan and Azerbaijan, effective power is in the hands of new autocrats. Nursultan Nazarbayev has been in power in Kazakhstan since 1989 and Ilhim Aliyev “inherited” the presidency of Azerbaijan from his father, who died in 2003. Turkmenistan is in the hands of President Berdimuhamedow, who took over from his father, the then ‘life-president’ when he died in 2006. Not only is Turkmenistan one of the most repressive regimes in the world, easily competing with North Korea, Berdimuhamedow has created such a personality cult that a day of the week has been renamed after his father! But while democracy failed to take hold, bureaucracy and corruption flourished. These social evils also flourished under the tsarist regime. Lenin and Trotsky, leaders of the Russian revolution in 1917, ensured the fullest possible democratic control by the workers and poor peasants over state organisations in order to combat these problems. However, when Stalinism came to power, following the brutal repression of these elements of workers’ democracy, it rested on the bureaucratic habits of the tsarist regime. Initially the planned economy established after the revolution proved very effective; despite the ravages of the Second World War, the Soviet Union grew from a backward, economically undeveloped state in 1917 to the second super-power, putting the first man into space. Yet, deprived of workers’ democracy, which Trotsky called the “oxygen” of the planned economy, the planned economy was strangled by bureaucratic incompetence, waste and corruption; it stagnated and eventually collapsed. The restoration of capitalism has done nothing to improve the situation. On the contrary, by the end of the nineties, economists, academics and even government ministers were complaining that privileges, the misuse of power and the corruption of today’s leaders have reached a scale surpassing even the dreams of the party bureaucrats of the soviet era. Now, the commissioner for fighting corruption in Russia, Kirill Kabanov states, “Corruption has reached such a level that it has become a question of national security”. He blames, in part, the mass privatisation of the nineties, but he goes onto explain that the corruption inherited from the Soviet period has become much worse because there is no longer an ideology that at least in words supported social, moral and civic norms. The much-publicised campaign against corruption by the Putin regime has done nothing to improve the situation. A few high profile arrests of senators, regional leaders and, in one case, leading figures in the Ministry of Defence, is seen as little more than an excuse to get rid of politically inconvenient figures. Of the 1,200 people arrested and charged with taking bribes in 2014, 20% were for bribes of less than 50 euros, and a further 40% for less than 500 euros. Meanwhile it is estimated that over 1 trillion rubles – 15 billion euros a year – is creamed off from government contracts by various bureaucrats and businessmen. And there are now plenty of bureaucrats. To become a chinovnik, the Russian word for bureaucrat, is associated with success by a layer of the elite. It means they have managed to get their nose in the trough. The ‘RBK’ business analysts have recently assessed the number of bureaucrats in modern Russia. Even though budget cuts have led to a reduction in the number of chinovniks there are now 25% more than existed even at the peak of the soviet bureaucracy. This figure underestimates the situation as there are many more chinovniks working in the large state corporations. This picture is repeated throughout the former republics of the Soviet Union. Corruption in Ukraine has rocketed since the victory of pro-western forces. Each of the fifteen ‘Soviet’ republics gained not just sovereignty but independence following the collapse of the USSR. The independence however is conditional. Each republic finds itself suffering from the struggle between the different imperialist powers for power and control of the regions’ wealth. Kazakhstan and the Central Asian republics find themselves caught between China, Russia, Turkey and the Western powers. Ukraine finds itself torn between US, EU and Russian interests. Even the three Baltic States who have tied their fate to that of the EU, struggle to deal with their Russian minorities. The experience of all these states is that genuine independence cannot be achieved under capitalism. The independence that has been achieved has been at a terrible human and social cost. The five-year civil war that raged in Tadjikstan (1992-7) led to the loss of up to 100,000 lives and 1.2 million refugees. Wars raged in Moldova and Georgia, between Armenia and Azerbaijan, between Russia and Georgia and within Russia in the North Caucuses. The two Chechen wars (1992-4 and 1999-2000) left, according to human rights groups over 50,000 military fatalities and up to 250,000 civilian deaths. Since the start of the conflict in East Ukraine, nearly 10,000 have been killed and over two million have become refugees. For decades, pro-capitalist commentators have spread propaganda about the human cost of the Russian revolution, which was almost bloodless. But they blame the Bolsheviks for the civil war which was, in fact, started by the opponents of the revolution and supported by 22 imperialist armies. They blame them for the crimes of the counter-revolutionary Stalinists and often even for the fatalities caused by Hitler’s invasion of the USSR, claiming that millions perished as a result of the revolution. But there is absolute silence today about the millions whose lives have been curtailed or who have become refugees as a result of the restoration of capitalism. All this is justified by the supporters of capitalist restoration as allowing the free market to grow, restore the economy and improve living standards. Yet this too has not happened. The whole region sank into a seven-year long depression following the collapse of the USSR – a depression not of classical capitalism, similar to that of the 1930s, but caused by the break-up of the planned economy. The scale of the depression is indicated by the fact that in 1996 the GDP of each former republic had fallen to 40-60% of its Soviet level. The dominant political ideology of the governments at this time was “shock therapy” – unfettered neo-liberalism. Some advocates of the new economic regime even argued for a Russian “Pinochet” to force through the reforms. Mass privatisation became the norm in Russia, Ukraine, Kazakhstan and elsewhere. The removal of all the restraints of the former soviet system led to the horrific growth of bandit capitalism. Moscow and the other major cities turned into 1920s Chicago-like ganglands as new owners, many of them former “communists” and soviet state officials, fought it out for the right to plunder the economy. The scene was set by Boris Yeltsin, who, to remove the opposition of the still then existing ‘Supreme Soviet’ (parliament) to his particular plans, sent tanks and the army into Moscow in September 1993. The siege of the Parliament’s building – the ‘White House’ – and the subsequent military assaults on the building and the TV centre, left hundreds dead. Meanwhile, unemployment became a mass phenomenon throughout Russia and millions of workers were left unpaid or had to wait months for payment. Inflation spiraled out of control. It reached an annual rate of 2,400% in 1992-3 and continued at levels of over 200% until 1996. The money-based economy practically disappeared as workers and the poor resorted to barter. In some cities, flats were left without heating and lighting and people cooked meals on bonfires. When, in September 1998, the ruble collapsed, losing two-thirds of its value in one month, a new period opened up. This coincided with the beginning of the growth in oil prices – from $12 in 1998 it grew to $98 a barrel by 2008. These two factors laid the basis for serious economic growth from 2000-2008. GDP grew by between 4% and 10% a year. The coming to power of Vladimir Putin in 2000, whose strict authoritarian rule compared starkly with the drunken chaos presided over by Boris Yeltsin, saw the legitimisation (at least in the eyes of the ruling elite) of the brutal gains of the nineties. The warnings by the CWI in 1991 of huge income inequality proved very modest. At the end of the Soviet Union period, the top 10% of the population had four times more wealth than the bottom 10%. Now they have 17 times more! Notwithstanding the economic growth of the early Putin era, by the start of the global crisis, 79% of the population only had enough money for food and clothing with nothing left over for larger purchases. Putin came to power, in part, following the victory of Russian troops in the second Chechen war. He promised to reduce the power of the notorious oligarchs who had become sickeningly wealthy during the Yeltsin era, mostly using violence and murder to protect their ill-gotten gains. He moved against some who declared their political opposition to his rule, such as Mickhail Khodorkovsky, head of Yukos Oil, but he easily found accommodation with the others. Putin’s rule was established to restore control and ‘order’ over the chaos released by Yeltsin. Restrictions grew on political opposition. In the economy, a determined strategy aimed at concentrating the key factories and economic structures into a series of ‘state corporations’, under the control of Putin nominees, gave almost unrestricted economic and political power to the Presidential circle. A deal was suggested – economic stability in exchange for political freedom – this, many argue, the Russian people were prepared to accept. The other former republics were not so stable. A wave of ‘colour’ revolutions swept the region, starting with the ‘Rose’ revolution in Georgia in 2003. The Ukraine’s revolution in 2004 was ‘Orange’ and Kyrghizia’s in 2005 was ‘Tulip’. Even Belarus, in 2006, had the ‘Jeans’ revolution and Moldova’s in 2009 was named after the grape. In every case, these represented explosions of discontent by the masses – at the economic situation, at corruption or election manipulations. In each case, however, there was no working class organisation armed with a socialist programme that could take the lead. Instead, sections of the ruling class, internationally and domestically, exploited these movements in their own interests. The 2008 global crisis brought the few years of growth to an abrupt halt. Some of the worst GDP drops in the world were recorded in the former Soviet republics. The three Baltic States undoubtedly suffered the worst falls in the EU, if not in the world, with their GDPs collapsing by between 13% and 18% in 2009, leaving them with unemployment levels of between 13 and 17 percent. The Ukraine, too, suffered a 15% drop and Russia 8%. Banks were nationalised to deal with the emergency in Kazakhstan, Russia, the Ukraine and Latvia. The response of those governments who could – those with reserves built up from the sale of oil and gas in the previous eight years – was to pump huge amounts into the economy. Kazakhstan, for example, “stimulated” its economy by using 15% of its GDP , far exceeding in proportion the 7% used in the US, at that time. There were massive currency devaluations in a number of countries; the Ukrainian hryvnia and Russian ruble were slashed by 40%. The other former republics were left relying on austerity. The cash injections, however, only served to delay the effects of the crisis. There has been no significant recovery from the 2008 collapse, the oil reserves have run out and now widespread austerity is the order of the day. The start of the global crisis marked the start of a new period of instability in the region of the former USSR. Russia has been shaken by crisis after crisis, from the Russo-Georgian war that broke out in the summer of 2008, to the explosion of protest that shook Moscow after the rigged parliamentary election in early 2012 and then the Ukrainian crisis which led to the Russian takeover of the Crimea and open war in East Ukraine. The Putin regime has relied on a combination of outright repression – with the imprisonment of key leaders of the “bolotniy protests” (during May, 2012, on the Bolotnaya square, Moscow, one of the biggest protests in Russia since the 1990s) and a spate of new laws practically outlawing opposition groups – plus a wave of patriotism following the Crimean events and in response to international sanctions. But it still fears a new “bolotniy”, only this time driven by working class discontent. Real living standards have fallen faster in 2016 than at any time since 1990. The regime’s fear explains the recent removal of key ministers and their replacement by faceless acolytes and this year’s reorganisation of the country’s interior troops and riot police into the “National guard”, reporting directly to the president. Elsewhere in the former USSR there have been big upheavals. Following the brutal suppression by the Kazakhstan regime of the oil-workers’ strike in Zhanaozen in December 2011 and the consequent repression, the protest movement is being restored in that key country, beginning with the oil-workers themselves. War between Armenia and Azerbaijan flared up again in April 2016, leaving dozens of soldiers from each side dead. Armenia has since been rocked by protests led by war veterans, who feel they have been badly treated. The Georgian capital, Tbilisi, has seen major protests throughout 2015 and 2016 demanding the resignation of the government and against the growing influence of Russian multinationals. Scores of protesters against the worsening economic position in Azerbaijan were arrested in January 2016. Moldova has been rocked by a year-long protest against corruption, bank fraud and the economic crisis. Protesters are torn between those who want unification with Rumania as a road into the EU and those who want to strengthen links with Russia. Nowhere is the situation worse than in Ukraine, whose government, since the victory of Euromaidan, has faced increasing corruption, a desperate economic crisis (with Ukraine’s GDP today actually lower than it was in 1990) and the continuing danger of war escalating out of control in the East of the country. Whatever the ruling elites of the region may wish, there is no stopping the desire of working people, youth, pensioners and even small businesspeople from moving into action to protest at their insufferable living conditions. With the centenary of the Russian Revolution of 1917 fast approaching, there will be an increased attention paid to the socialist ideas of the leaders of that revolution. Putin and his colleagues in the other republics will do all they can to discredit those ideas next year. Our task is to ensure that they are properly explained to the masses, that they are used to arm the movement in the struggle to improve wages, protect jobs, defend the health and education systems and in defence of democratic and national rights in a movement uniting workers and youth of all nationalities to fight for a genuine, democratic and internationalist socialist society.